Clr. L.M.D. Ntombela is the mayor of the Mafube Local Municipality. Louis Madala David Ntombela was born in Frankfort, Namahadi in 1956. He is the last born in the family of three boys. Mayor Ntombela attended the Inkamana High School, Vryheid, where he obtained his matric and proceeded to Indaleni Teachers Training College where he obtained his Teacher’s Certificate followed by a diploma from the Potchefstroom University. He continued his tertiary education and obtained his BA degree from UNISA. He started his career as a teacher in Mamafubedu (Petrus Steyn) in the early seventies and continued until he was promoted to become a school principal in Mafahlaneng (Tweeling). It is here that he met his wife, Hexonia Sisi Ntombela, and they have been blessed with four children, a girl and three boys. He started to be involved in politics of the teachers’ union and participated actively in the ANC. He helped form ANC branches in Tweeling and Frankfort. He was the Regional Treasurer of then Frankfort Region and re-elected again for the Fezile Dabi District since 2000. He was the TLC (Transitional Local Council) Executive Chairperson. When towns were amalgamated he was first elected as speaker of Mafube until he was elected as mayor in 2006. 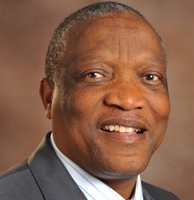 He was re-elected as Mayor of the Mafube Local Municipality in 2011 and is currently also serving as the Deputy Chairperson of SALGA Free State.